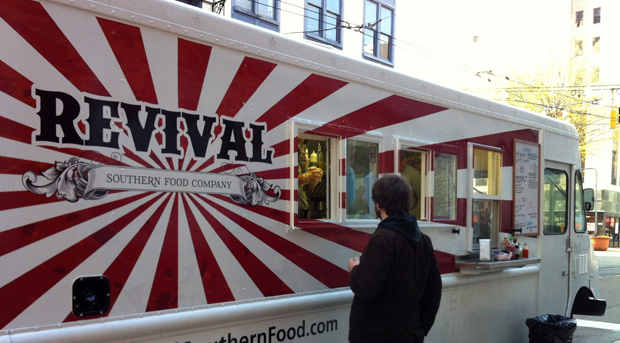 Revel Systems, the company that is selling iPad checkout services to retailers around the country, is coming out with a new version of their app for food trucks. The food truck version is cheaper–$1,999 compared to $3,300–but has lost certain features like employee tracking and employee scheduling. It comes with a useful addition: Twitter integration inside the app itself, which will let food vendors tweet without switching between apps on their iPads. Perhaps the most useful and food-truck-friendly feature is the integration with the Revel Router that Revel launched a few weeks ago. For an additional $3,200 the Revel Router taps into the network on a 3G iPad and allows wireless transmission to other devices. “You can print into the kitchen of the food truck and you don’t have to worry about the Internet going in and out,” Lisa Falzone, cofounder and CEO, tells Fast Company. CTO Chris Ciabarra says the app could also be used for non-food vendors like those at put up stalls at farmers markets, or concerts. Like the full retail version, the food truck app also integrates with the mobile payment company LevelUp.